DES MOINES, Iowa — Republican leaders are growing alarmed by the ferocious ways the party’s mainstream candidates for president are attacking one another, and they fear that time is running out for any of them to emerge as a credible alternative to Donald Trump or Sen. Ted Cruz of Texas. Leaders of the Republican establishment, made up of elected officials, lobbyists and donors, are also sending a message to the mainstream candidates, such as former Gov. Jeb Bush of Florida, that they should withdraw from the race if they do not show strength soon. The members of the party establishment are growing impatient as they watch Trump and Cruz dominate the field heading into the Iowa caucuses on Monday and the New Hampshire primary eight days later. Party leaders had hoped that one of their preferred candidates, such as Sen. Marco Rubio of Florida, would be rising above the others by now and becoming a contender to rally around. Instead, they have a muddled field of battered mainstream candidates: Bush, Rubio, Gov. John R. Kasich of Ohio and Gov. Chris Christie of New Jersey. The establishment candidates and their allies have spent about $35 million attacking one another, and there is no sign that they plan to relent anytime soon. A super PAC supporting Bush is targeting Rubio in advertisements in Iowa and New Hampshire for reversing himself on an immigration overhaul and Tuesday began broadcasting a commercial accusing Rubio of exercising “bad judgment” for using a Republican Party credit card for personal expenses. Late last week, the same group began broadcasting a commercial in New Hampshire assailing Kasich for expanding health care in Ohio under the Affordable Care Act. A super PAC supporting Kasich quickly swiped back at Bush, mocking him for a campaign that “sank like a rock.” At the same time, a super PAC backing Rubio continues to blast Christie, reminding Republicans of the scandal involving the governor’s aides over lane closings at the George Washington Bridge, and of his embrace of President Barack Obama in 2012 after Hurricane Sandy hit New Jersey. That prompted Christie to lash out at Rubio on Sunday during a town-hall-style meeting in Portsmouth, New Hampshire. The governor ridiculed Rubio at length for his incomplete attendance record in the Senate and noted that some of the ads on Rubio’s behalf were funded by a group that did not have to disclose its donors. The cumulative effect of all the ads, and corresponding attacks through harshly worded mailings, has been to stunt the growth of the so-called establishment candidates, keeping them clustered together in New Hampshire polls while Trump soars. “These guys are so busy fighting one another that they’re only continuing to facilitate the rise of Trump and Cruz,” said Rep. Tom Cole, R-Okla., a longtime Republican strategist. After the Iowa caucuses, and then the New Hampshire primary Feb. 9, the pressure on those candidates who are lagging in the polls will intensify. 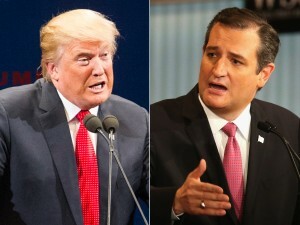 “Whoever is not named Trump and not named Cruz that looks strong out of both Iowa and New Hampshire, we should consolidate around,” said Henry Barbour, an influential Republican strategist based in Mississippi. But it is not clear that the Iowa and New Hampshire results will come so neatly, or that the also-rans will be so willing to drop out after two states. Bush, in particular, still has the support of a well-funded super PAC. And even if he were to trail Rubio after the first contests, Bush might still fight on to South Carolina, where he recently won the support of Sen. Lindsey Graham and where he plans to call on his older brother, former President George W. Bush. Some in the party now concede that it might take until March or beyond for the Republican establishment to coalesce behind an alternative to the current front-runners. And that could be too late to catch Trump or Cruz. Many in the party say they believe the assault by Bush against Rubio has been particularly damaging. Rubio has stepped up his complaints in recent days about the ads from Bush and his supporters. Rubio aides have been working aggressively behind the scenes to portray the attacks as strengthening Cruz and Trump, highlighting, for instance, an article in The Weekly Standard that argued that Bush would be to blame if Trump became the nominee. But it is not just supporters of Rubio who are uneasy about the attacks against him by the super PAC backing Bush, Right to Rise, an assault that will have lasted two months by the New Hampshire primary. Asked about the attacks, Cole, who has not endorsed a candidate, suggested Republicans would not tolerate them much longer if Bush did not show viability in Iowa and New Hampshire. The party’s major contributors are starting to become increasingly vocal in their impatience. “The next couple of weeks are very important for Jeb,” said William E. Oberndorf, who has given more than $1.5 million to Bush’s campaign and the super PAC backing him. Others in the party’s donor class are so worried that they are already envisioning another path to their preferred nominee, months after the primary contests, at the Republican convention this summer. Earle I. Mack, a real estate developer and former ambassador to Finland under George W. Bush, said the heavy bloodletting in the Republican race might prevent any candidate from clinching the nomination. In that case, he said, Republicans should turn to Speaker Paul D. Ryan. “In these horrible crossfires, with everybody shooting each other down, it would be good to nominate somebody uncontroversial, who could appeal to a broader electorate,” Mack said. Want to know why Donald Trump is beating Marco Rubio? Watch this interview. Want to know why so many Republicans hate Ted Cruz? Read his book.